Stash it all in this revolutionary alternative to plastic bags and containers. Made of pure platinum food-grade silicone, it’s a healthy alternative that’s safe for people and the planet. Durable and easy to clean, you can use it again and again and it can safely go from the freezer, to the microwave, and to the dishwasher. In fact, one bag can replace thousands of disposable plastic bags, so you can save money while you’re saving the planet. Omg! I have wanted some of these for awhile!! You could send me a few more of these as repeat months and I would totally be ok with that!! I have become more conscious of my plastic footprint and this is going to save 1000’s of plastic bags from ending up in our landfills Or oceans! 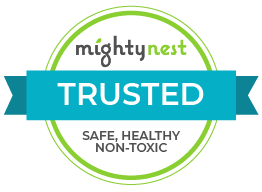 Thank you for this mighty nest! I absolutely love this product. I've typically hated silicon kitchen items because they aren't sturdy enough to hold up to the weight of whatever's inside but this definitely doesn't have that issue. I’ve been slowly building a collection of stasher bags (family of 4, so we can go thru at least 4 in a day!) and I’ve yet to find any that are as good of quality and as easy to clean. Just pop them in the top rack or the dishwasher and then leave them open over a dish towel to dry and you’re good! Ditch the plastic for good!!! I absolutely love these silicone bags. I have purchased additional sandwich size bags and plan to get more of the half gallon and snack size bags. I've completely did away with the old ziplock bags and can't waiting to fully stock my kitchen with all the sizes I need. Total game changer!!! I love that this product can be used as an airtight container and is also dishwasher safe on the top rack. Makes life easier when I can toss it in with the other dishes. So I actually came across this by accident. Once I searched this I did lots of research and my fiancé and I decided to get rid of plastic as much as possible. So we signed up for mighty fix. I have been so excited and watched lots of the youtubers unboxing things they have received. My mind was blown when I received this stasher bag because I told my fiancé we needed to order some when I browsed this website and then I received one. it is great quality and I was iffy at first so I filled it with water and sealed it and it didn't leak and now I'm hooked. I've been telling all of my friends and family about this subscription and they will be signing up. I love having these for lunches and snacks. I always wash them right after use and haven’t noticed any residual odors which was originally something I was worried about. Love These! I keep a variety of frozen veggies on hand for quick sides and this little thing steams them in the microwave perfectly. I received this Monday in my MightyFix. I've seen these before and was hoping to get a Stasher bag in my Fix soon. I've had it for 3 days and have used it twice already! I could use a few more. It would be nice to use these to put my frozen bananas in. I used it for chips and bread already in my lunch pail. The material is durable and the seal is secure when zipped! I got this with my MightyFix subscription and loved it so much that I bought a second one and plan on getting more. I use them for storing my cheese in the fridge, snacks, and sandwiches. I also use them for storing my bath/body products in my suitcase when traveling. I do wish they came in bigger sizes too!! I got one in my MightyFix and loved it!! It's awesome because I hate using plastic baggies, and I like that it seals. I have 2 now from purchasing another and I use them all the time. I wish they did come in different sizes such as a gallon size and in a lower price point, but I guess it'll save me money in the long term. These bags hold up through the toughest stuff. They're easy to clean, through it in the dishwasher. I love storing food in them because they are clear and I can see what's inside. And they close with a tight seal. Will be purchasing more! Great for hot weather! Unique cooling device! I place three ice cubes in the Slasher, close it, and wrap a cotton dish towel or scarf around it. Then, I tie it around my neck with the cubes in the back and it keeps me cool on hot days in the garden. It's also great for the use it was originally intended. I love these - they are the absolute best! easy to clean, safe for kid usage, are microwavable, and top rack dishwasher safe!! Perfect to be used as storage bags or lunch bags. Replace all the ziplock bags, etc. These are awesome! Will be purchasing more for myself, and my family!!! They hold up and last a very long time!!! Received this in my Mightyfix subscription. I absolutely love it! Finally, an airtight solution that actually works! I tested it by freezing liquid in it, cooking in it, and by washing it in my machine. I only wish it came in a gallon size so that I could easily marinate, freeze/store, and reheat a whole family meal. But this size is perfect for leftovers. I'll be purchasing more in the future! I was so excited when I received my Stasher bag in my MightyFix subscription! I've been using it consistently since I got it and I will be purchasing more of them very soon. The silicone material feels sturdy and pleasant to hold, and the seal is easy to open and close while still remaining secure. It's hard to use just one, though, so I'll definitely be purchasing more so we can completely kick plastic baggies from the house. I can't recommend this product enough! It's become a staple in my routine after only a few days! Love these silicon bags. I have been looking for a replacement for ziplock baggies & these fit the bill, My child is easily able to open & seal shut these silicon bags. I just wish that they can in a snack size & gallon size. These are about the size of a quart ziplock bag. Easy to clean & I feel good knowing that my child isn't being exposed to all those horrible chemicals. Great baggie to replace plastic ones. They hold up amazingly. Would’ve gave 5 stars but wish there was more than 1 in the package. Great for sous vide cooking as well as just general lunch uses! I love this bag as an alternative to plastic. It easily opens and closes. The only problem is it seems to be air-permeable. A couple of times I've put some chips from a new bag in it and the chips have gone stale fairly quickly - not what I would expect had they been in a plastic bag. Other than that, I love the stasher and would recommend it! Nice little baggies. Thick and sturdy, holds a decent amount. Just a warning, if there is air left inside after closing and the bag is squeezed it can pop open. While this is a neat idea for saving space, it's still, at the end of the day, not recyclable. I'd much prefer something made from #5, that's readily recyclable than an all-silicone item that's trash the instant it cracks. A fighting chance at re-purposing and recycling is better than no chance at all. I appreciate that the rounded top and narrowed opening are to make it watertight, but it makes if difficult to get anything in or out. I haven't tried to put a sandwich in as my homemade bread is wider than a store loaf and I would crush it. I also have a hard time getting these open. I am fearful each time that I am trying to open it in the wrong place and will tear it. I have opened it correctly, but it is not easy to do. I love the idea of this, but I feel the design needs improvement. It could use stronger adhesion or reinforcement at edges of zipper. My boyfriend split the edge/seam by opening it too far the first time he tried to access his sandwich. It's still usable for PB&J's, but not water/air tight. I really wanted to love this, and I love the idea, but unfortunately it is not airtight. I put a block of cheese in it, and a few days later the cheese is hard as a brick and unusable. I'm not sure if it's the seal that is leaking air or what. I tried a couple different times and made sure I sealed the whole top thoroughly. I think these would work well for a lunch bag for short-term food transport, but not to keep things in the fridge. Too bad!! This bag came out of the first dishwashing cycle covered in a cloudy film. I hate to hand wash, so I rarely use these bags, even though they are a good size and has cute patterns. If silicone does fine in your machine, or if you don't mind hand washing, these might be great for you. I received this in my MightyFix and thought it was great. I used it for bringing bread to work to eat with my salad at lunch. The second day I brought a piece of bread in it to work, I noticed the corner had torn and now the bag was pretty much useless. The top heavier corner of the bag had split and the rip had moved about half an inch into the thinner plastic of the bag portion of the product too. Nice product idea, but if it it breaks after 2 uses, perhaps it needs to be made a little more durable. Inspiration and innovation seem to go hand-in-hand. Stasher founder Kat Nouri had her a-ha moment while making a sandwich. As a busy mother of three, Kat had been making school lunches for years, and every time she packed her kids’ sandwiches in disposable plastic baggies, she’d think there’s got to be a better way. aside from the millions of pounds of plastic that go into landfill each year, she was concerned about the effects of petroleum-based plastics on her family. As the founder of international lifestyle brand modern-twist, Kat was already using pure silicone to create sustainable housewares and children’s products—why not design a reusable bag made of silicone? why not, indeed! after more than two years of rigorous product development, the world’s first fully functional, self-sealing non-plastic bag was born: stasher. Since its debut in 2016, stasher has won numerous awards, including the prestigious global innovation award and the design industry’s red dot award. kat recently had another a-ha moment while packing school lunches: we need to create a snack size to go along with the sandwich size stasher! the good news: snack size stasher is currently in production, and will be available soon.